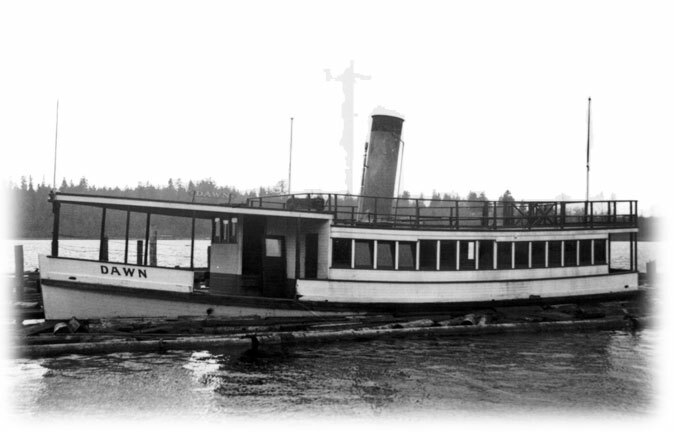 The Dawn was a pretty, toy-like little steamer that was built at the Houghton shipyard in Kirkland, Washington in 1914. She was 55 feet long with a beam of approximately 15 feet. The Dawn was used to ferry passengers on Lake Washington from stops on Mercer Island to the Leschi Park dock in Seattle. She had a captain and purser as crew. Many of her passengers were children on their way to and from school. With the advent of the automobile, most residents of Mercer Island chose to keep their vehicle at Leschi and ride the Dawn. While it was possible to cross the east channel bridge and drive to Seattle through Renton, it was a long trip. In the 1920’s automobile ferries began to operate on Lake Washington, and the Dawn’s service as a passenger steamer ended. On December 24, 1923, the Dawn was sunk at the Leschi Park dock by a gale that swept through the area, but she was later salvaged and returned to service. In her later years, the Dawn was used as a party boat for entertainment purposes. 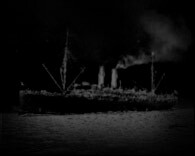 According to Gordon Newell, the Dawn was dismantled in 1938 and her engine and boiler were removed. Presumably her hull was intentionally scuttled sometime thereafter.